Description of "Rewire Your Brain (eBook)"
Have you ever wondered why life seems to be so unfair and negative? Have you ever wondered why some people seem to be naturally more positive and happy than others? Would you be surprised if we told you that you could also be that happy? It is true, without any gimmicks, expensive equipment, medicine, or special foods, you can also live your life feeling positive and being happy. The power to be less negative is already within you, it is within us all. Learn how our minds and bodies are connected and how to use that to your advantage. We will walk you through how to recognize the negative thinking and how to replace it with positive thinking. Would you like to feel better, smile more, be better able to handle problems when they come up? It is all within our book, and we would love to help make your world a happier place! Michelle Steven owns a small bookstore in Richmond, Virginia. After going through many hard times, including a divorce and the loss of a parent, Michelle was able to pull herself out of a deep depression and get her life back on track. She has remarried and has a child on the way. She also will give lectures about how to apply the Law of Attraction to get what you want. 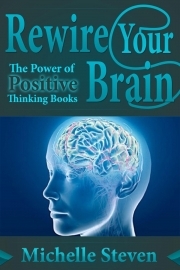 Reviews of "Rewire Your Brain (eBook)"